Northwood FRUIT and FLOWERS Card Tray in Marigold. NORTHWOOD FRUITS AND FLOWERS - 7.5 in. Card Tray - Amethyst. 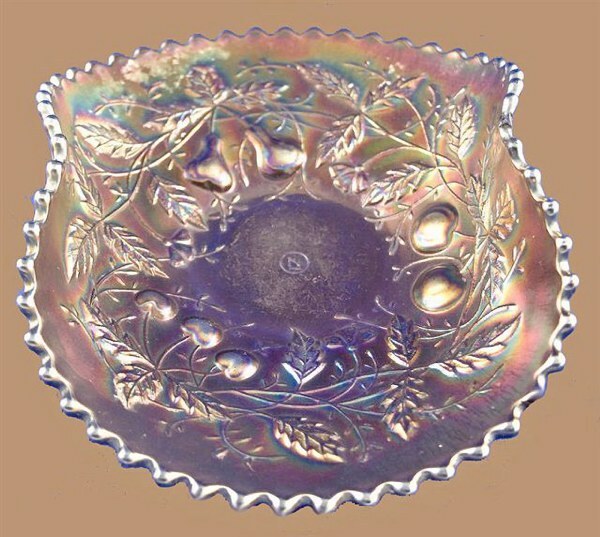 FRUITS & FLOWERS 7”- 7 ½” Plate: Compared to other shapes and sizes within this Northwood pattern, card tray shapes in marigold, amethyst and green, along with the hand-grip shape are seldom found. 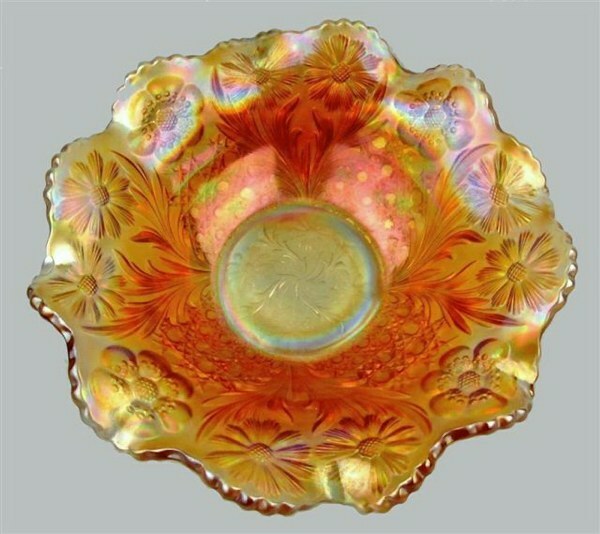 8”-9” plates are known in amethyst and marigold. Footed bonbons are quite available in a multitude of colors! Lancaster- 8.5 in. Candlestick in Marigold. 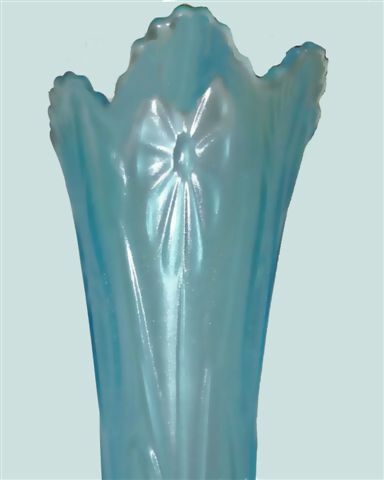 CANDLESTICK: Lancaster Glass Co. operated from 1908 to 1937, when Anchor Hocking assumed operations. 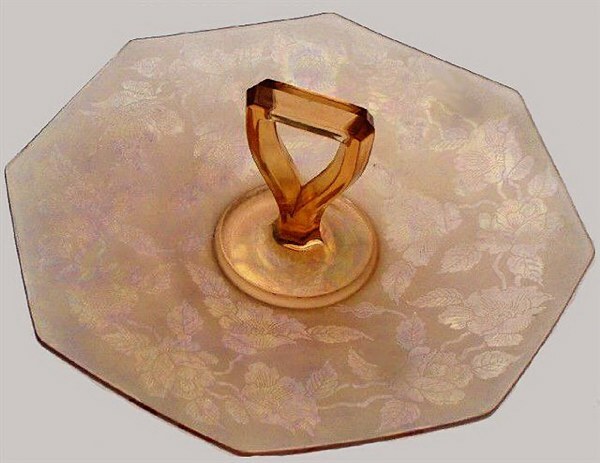 For the time in history when Lancaster was in business, their glass designs were of a modernistic mode with simple lines and smooth surfaces, such as seen on this candlestick. The factory was situated in Lancaster, OH. This candlestick surely offers a style not followed by most other producers of that era. 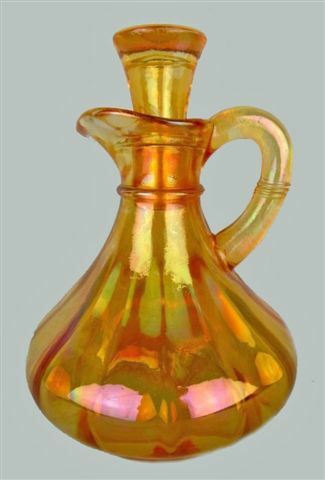 Marigold CRUET by Anchor Hocking Glass Co.
CRUET: We might consider the modern lines of this cruet as having been a part of the moulds purchased by Anchor Hocking Glass when assuming operations of the Lancaster Glass Co.
U.S. Glass - 8 in. COSMOS and CANE in White. U.S. Glass - 10 in. COSMOS and CANE Ruffled Bowl in Marigold. 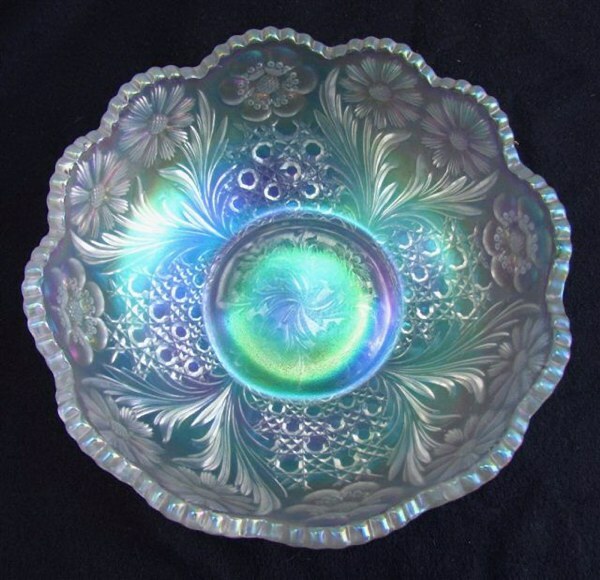 COSMOS & CANE Bowl: One of the most eloquent of all U.S. Glass designs, the white examples are quite beautifully iridized. True marigold is rather unusual to find, since the shapes within this pattern are more often found in the Honey Amber tone. These two bowls are from the 10” diam. mould, with 2” added in the flaring of the marigold example. Mid-Winter 1927 Butler Bros. Wholesale Catalog. FIELD THISTLE Vase in Green. Courtesy Kyle Berrier. FIELD THISTLE Vase: Kyle Berrier contacted us with this green vase sometime ago. The Butler Bros. Catalog ad rather “dates” the period of manufacture. By clicking into - F- in our pattern alphabet on the homepage, you will be taken to other shapes within this pattern from U.S. Glass. 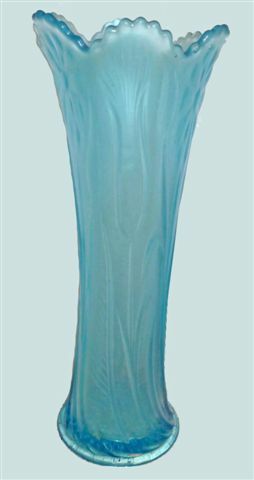 Do you think that perhaps this color was developed as part of the Depression Era transition? It does not appear to be iridized. U.S. Glass - FIELD THISTLE in Celeste - Courtesy Greg Dilian. (Found 12-11-13). FIELD THISTLE Vase: Greg Dilian discovered this celeste vase for sale on eBay! 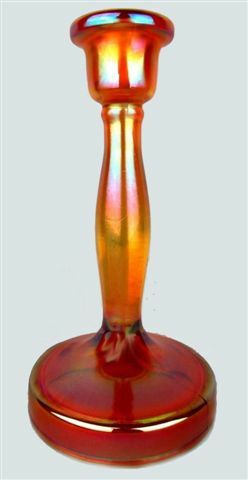 Since only a few shapes have been found in this base glass color, is it possible that they were experimental pieces never placed into production quantity? Cambridge - Marigold.SWEETHEART Cracker Jar - Seeck Auctions. 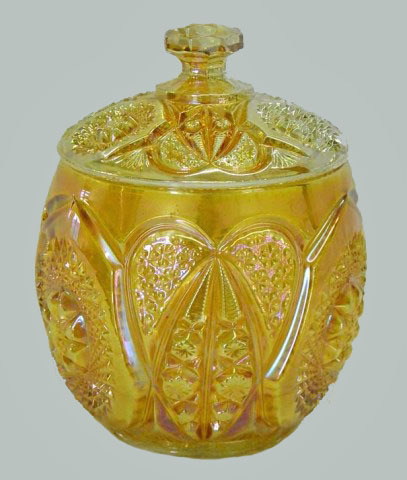 SWEETHEART Cracker Jar: Seeck Auctions sold this marigold example. There are a few marigold tumblers in the pattern, along with a small ice cream shaped bowl. 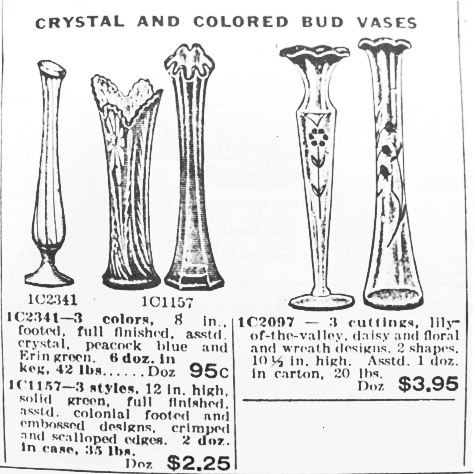 These, along with a green cracker jar in this pattern may be viewed in our Cambridge – Part VI. Fostoria - BROCADED ROSES 10 in. Sandwich Tray - Pink. 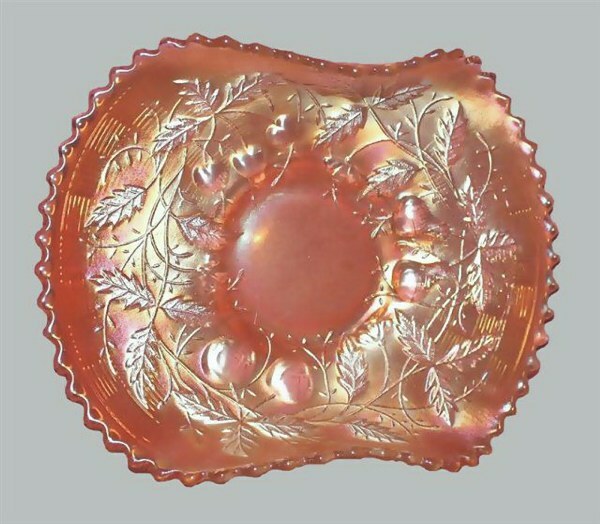 BROCADED ROSES Sandwich Tray: This pattern is not seen as often as Brocaded Acorn, for instance, and displays quite nicely on the pink glass. You will find several other segments surrounding the patterns produced by Fostoria listed on our homepage. Their designs were etched onto the exterior of the various shapes. My brethren, count it all joy when you fall into various trials. Knowing that the testing of your faith produces patience. man suppose that he will receive anything from the Lord; he is a double-minded man, unstable in all his ways.